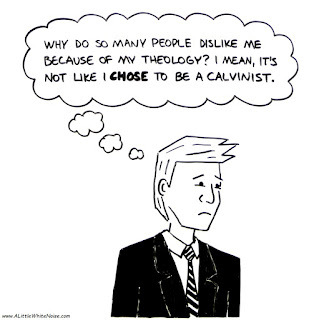 From Christianity Today: Eight moments you'll only understand if you're a Calvinist. #1 is courtesy of yours truly :). Should churches use a confession of faith? Can you believe it? A Calvinist was able to go 19 hours without starting a debate. It looks like a group of Southern Baptists invited a pseudo-universalist to speak at their anti-Calvinism conference. J. D. Hall discusses the issue (starting about 54 minutes into the program). If Calvinism is true, does that mean gays are right? Yes, God knows the exact day you will die, and that day was determined in eternity past. What is the deepest root of your joy? The fight over the future of public education in America is "predestined to be a really messy fight." Roger Salter on Anglican anemia. J. D. Hall wants to talk to some of you Calvinists. John Piper on how God makes known the riches of his glory to the vessels of mercy. To Colby Cosh, the statues of Farel, Calvin, Beza, and Knox at Geneva's Reformation Wall look "at least a little like caricatures of Muslim fanatics." He believes Christianity was "tamed" when we made the Bible literature. He would like to see the same kind of "enlightenment" occur in Islam. Enter to win a copy of John MacArthur's Biblical Doctrine. Emily McFarlan Miller lists five facts about Betsy DeVos that apparently disqualify her for heading up the Dept. of Education. I'm not sure how anyone can be unqualified for a position that shouldn't even exist, but what do I know? 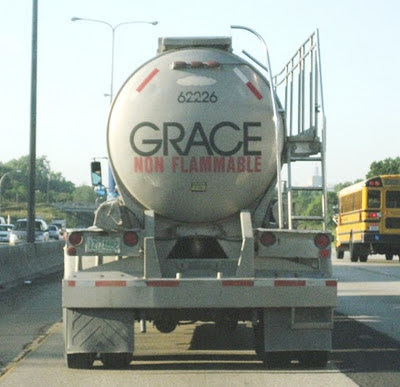 "I don't think Calvinism is divisive," says Pastor Willy Rice. "I think some Calvinists can be divisive. I don't think non-Calvinism divides. I think some non-Calvinists divide. It's arrogance that divides us. It's strife that divides us—mostly arrogance. It's trying to be first and not think highly of my brother in Christ—that's what ends up dividing us—whether it comes in a Calvinist uniform or a non-Calvinist uniform." The fine points of Calvinism. If Ronnie Rogers wants to talk mysteries, perhaps he could explain the mystery of how it's possible for an omnipotent God to fail in his quest to save every human being he desires to save. It's Free Stuff Friday once again at Challies.com. Today's prize is a Zondervan Study Bible. Clifton Stringer warns of the "spiritual dangers" of Calvinism and Arminianism. He wants people to move beyond the two theological constructs and embrace universalism. Stephen Corry discusses what he sees as the religious, Calvinistic, and racist origins of the modern environmental movement. Betsy DeVos, President Trump's pick for Secretary of Education, is dominating the headlines. And, as Julia Duin notes, "Journalists can't seem to get a handle on details of her faith." "By blaming the Christian Reformed Church (CRC) for DeVos's political positions," writes Abram Van Engen, "we mistake its actual teachings, misplace the religious roots of her worldview, and misconstrue the way religion actually shapes behavior and belief." Do I have any righteousness of my own? John Piper deals with this question.